Twin Air LLC is proud to support our men and women in the armed forces and their families. 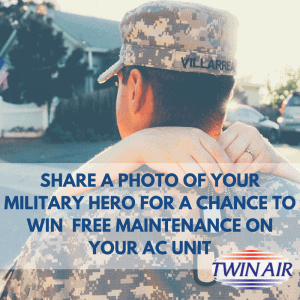 This month from July 19th- August 9th upload a picture of you with your loved one in the armed forces for a chance to win a free seasonal maintenance checkup on your HVAC system. To enter please submit your picture here and vote for your favorite entry. We can’t wait to see your submissions!